Happy Memorial Day! I'm so thankful for our brave soldiers for their service and sacrifice. What do you have planned today? Yesterday we had a cook out at my parent's house, but today we're relaxing and getting things done around the house! 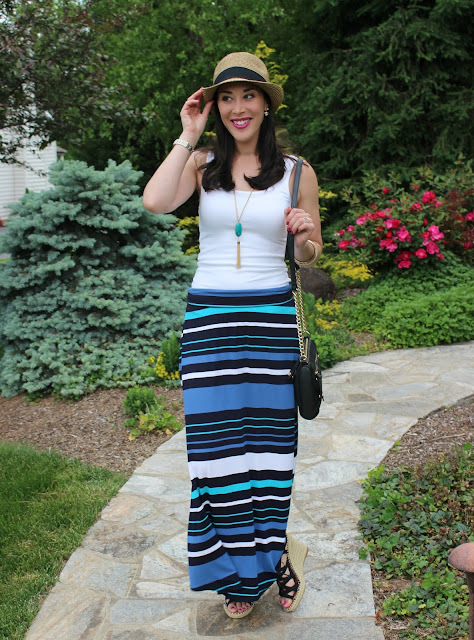 This summery outfit is so comfy and effortless! I love a good maxi skirt during the summer months. 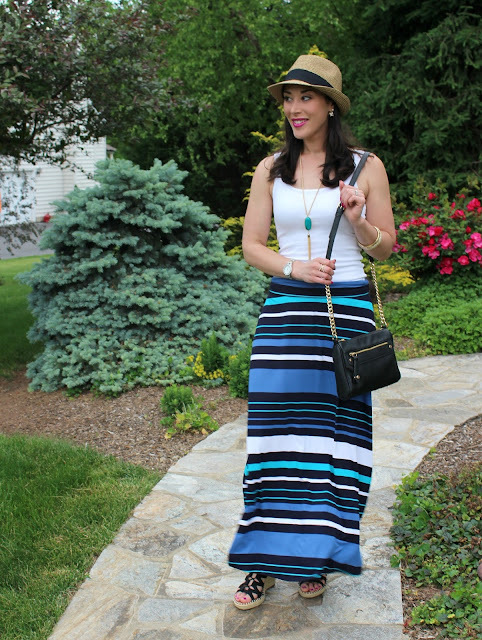 I like wearing maxi's on a mild summer day and they're perfect for summer evenings! 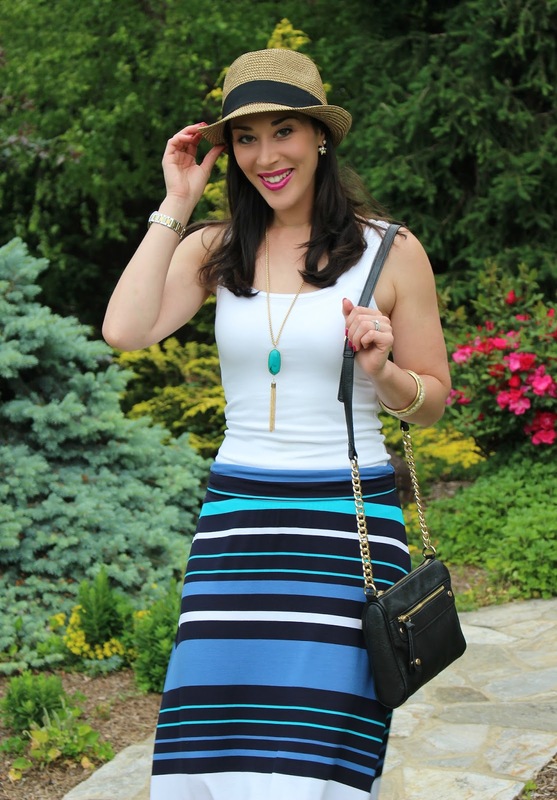 My striped maxi skirt is from Target and on sale for $15!! One of the things I like about this skirt is the length. I usually have trouble finding maxi skirts/dresses that aren't too long (I'm only 5'4"). This one is a good length and I can wear it with sandals. Also, the material isn't too thin! My exact color combo is sold out, but there are 5 other colors to choose from! If you're liking mine though, check out the sale racks at your local Target- that's where I found it! These super cute lace up wedges are on sale at Kohl's for $39.99. They are pretty comfy and the wedge is a nice height. There are a few colors to pick from (I also like the gold), but hurry- sizes are going fast! For earrings, I went with my Stella & Dot Eva Ear Jackets. They are so pretty!! They can be worn 4 different ways and have interchangeable studs (studs can be worn alone, too). 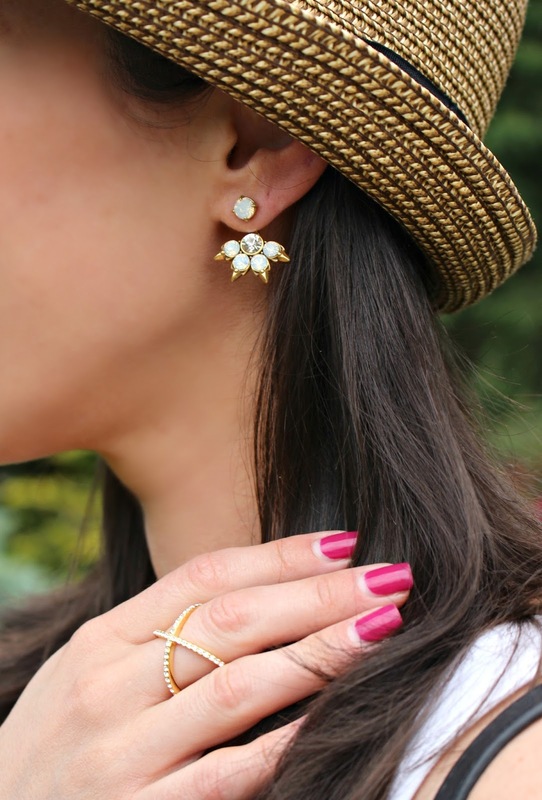 I wore the crystal stud with this outfit, but I probably get more wear out of the rose quartz stud. I'm loving blush and light pink this year! My turquoise/gold tassel necklace is from a boutique shop, but I found a similar one at LOFT that is gorgeous for summertime! It's an extra 40% off for Memorial Day Weekend ($20). I recently found the perfect straw fedora hat at Nordstrom! The fit is great and it goes with everything! I've been wearing it on repeat lately. It's $18 with free shipping. 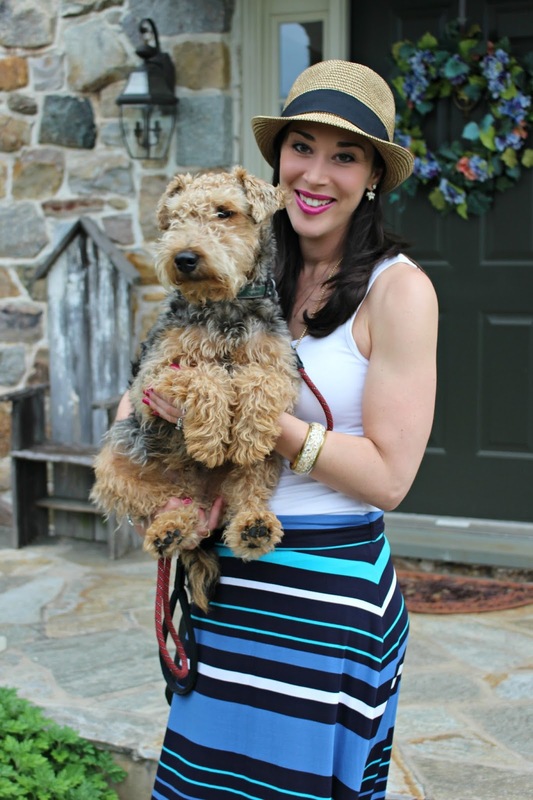 I definitely recommend it if you're looking for a summer hat! An adorable pup always makes for cute photos! Love, love, love this look! So cute!! Perfect summer look. I am in love with ear jackets right now! Thanks girl! Me too- love the ear jackets! Adorable! I'm all about a maxi skirt this time of year. The hat is great too!